One Young Couple + One Very Sick Baby= HELP! If there was ever a post that I didn't want to write - this one would have to rank up there as the all time winner. This is a sad drama involving my girlfriend's niece and her newly born great-nephew. Imagine a couple married for a couple three years - he is a young guy in the Navy and she is a young bride away from all of her family. He is working on a boat in harbor in San Diego. He has no threat to be sent to active war but military is military. If you aren't doing the fighting, you are supporting those that do. That your precious newborn who seems perfectly normal except for a skin condition - will most likely die in the next few months. He's admitted to the hospital - on the spot. The baby is isolated which you are told is mandatory for his condition. You make a visit to his room. As is normal, a transfer to another room soon becomes in order. When you arrive at the new room - you find another baby there. "Wait...isn't my baby supposed to be isolated?" you quickly ask. "Ooops, that was a mistake. We got caught in a shift change" - it's not what you want to hear but you thank God that you were there. "Well....that is what it said in the chart" - and after letting the nurse know that the chart is wrong, you now know that you have to keep the vigil at that hospital bed no matter what the outcome ends up being. You probably would have anyway but with two obvious oversights in the first week, you trust you and you alone. The baby soon must be transferred to another hospital 2-3 hours away - the father has to keep working. You have to quit your minimum wage job and leave home to stay with the baby. Every hour you have to leave the room - so you can be rescrubbed and put on new sanitary skivvies just so you can be able to reach out and touch your flesh and blood with your gloved hands. 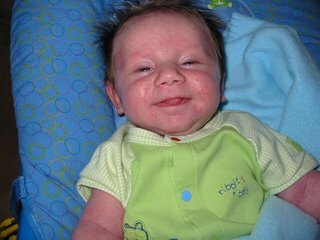 The baby is happy, googly, and flirting with the staff - like good babies do...but you know that a bone marrow transplant is the only way that this baby has a chance. You aren't even sure what is wrong with the child. Their is a suspicion that it is Omenn's Syndrome. If it isn't that, it's some sort of SCID (Severe Combined Immunio Deficiency). Please pray for Baby Maddox - and for his mother, Amanda, and her husband Jason. Remember, Amanda isn't working. She has to stay at cheap hotels by the hospital. Right now, she is able to stay at the Ronald McDonald house. While grateful for that, it still has a $14 a night charge. It's $14 that is tough to come by when you weren't exactly living life to the hilt before leaving your minimum wage job. Trust me - there's no internet scam involved here. Just a young couple in a very dire situation where the best you have to hope for is a successful bone marrow transplant and a bunch of financial strain. While a bit helpless regarding the former, a little from a lot of people can help take care of the latter. After 14 years of living in my last house - I finally made a move a bit over a year and a half back. At one time, the old homestead probably had 6, 7, or 8 cats hanging around. I can't really how the collection came to be. They just started showing up. My ex had a bigger heart for the felines than I did. 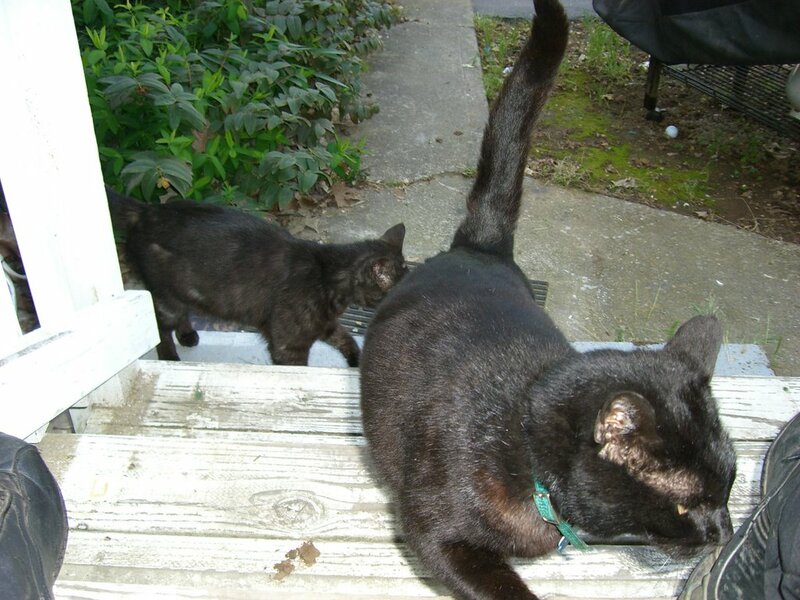 ...Yours Truly and Stogie - my stout 8 year old black cat featured prominently in the picture. But....wait.....if there was only one cat, what is that hanging around in the back of the picture???? It's another black cat!!!! - meet Shadow, the little girl kitty that "showed up" not more than a few weeks after moving in. Stogie is a pretty social fellow. The old neighbors actually hated to see him go. Well, he drew this new, young chick in and, well, with the CEP already declared successful and done, this old curmudgeon decided that the two of us boys could stand having a little female accompaniement in our new living space. Ever since that day - those two black cats have been inseperable. Hence, how she got the name Shadow. As for Stogie and how we derived his nom de plume? Back in my cigar smoking days, I would sit outside and draw on a big fat robusto. Stogie seemed to enjoy jumping up on my lap and savor the aroma of the smoke being blown into his face (OK....maybe you can call the SPCA now for subjecting my cat to second hand smoke...I'll call my attorney and meet them in court). What Do You Want to Make of This? .....no to all of the above. Come on, you knew San Francisco was out. 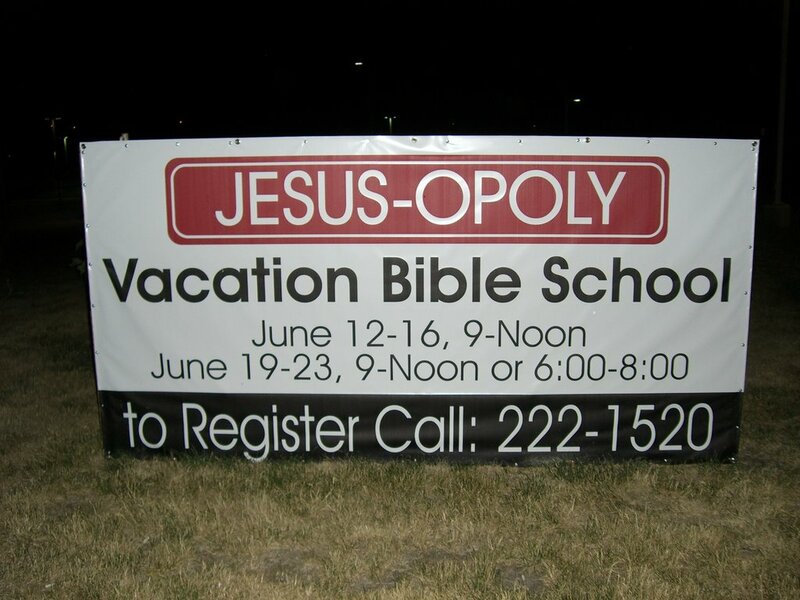 Not much Jesus promoting going on in that town!!! (Pardon my little joke for all you Bible carriers down in the City by the Bay....I know you are trying....just outnumbered). Actually, I was in Des Moines, Iowa - more specifically, WEST Des Moines, Iowa, which is NOT to be confused with Des Moines, Iowa. Well, you could confuse the two and I don't actually think anyone would care a whole bunch. If you are outside of Des Moines, no one notices and if you are in Des Moines proper or Des Moines West, their probably just happy to have you mention Des Moines for anything. Anyway, I am out on my walk and I come across this sign - sitting smack dab in front of a mega-church. Right out there in good midwest, strong values America. I didn't really know what to make of it.....and I still don't. There is a part of me that wants to say, "it's all for a good cause...it's just for fun.....lighten up." 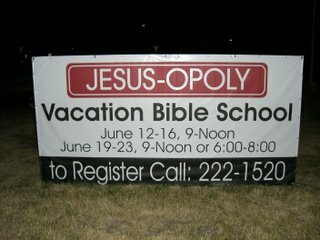 There is another part of me that remembers Jesus throwing money changers out of the temple and, if there was ever a game that was purely about money, it has to be monopoly. Then.....you have that whole not taking the Lord's name in vain and we shouldn't blasphemize thing - to contend with as well. ....which may not be a bad thing at all - as neither mainstream society or mainstream church have done much to hold my interest for quite some time. I still, however, love that Jesus guy! I have been doing a bit of travelling lately - mostly on business. The travel process can be quite draining and stressful...even to some of us with a pretty steady constitution. I have to share the HappyUPs I had jotted down in my journal from last Monday. I had to arise by 3:30 a.m. to catch a flight from Northern to Southern California. It's only an hour's flight but, post 9/11, a simple flight is a rare commodity. Beat the 3:30 alarm clock - by waking up at 3:15. I am so thankful that I have this talent of being able to tell myself when I want to wake up...and then having it work. I still don't trust it enough to not have the alarm as a backup. I just like waking up on my call rather than the alarm's. 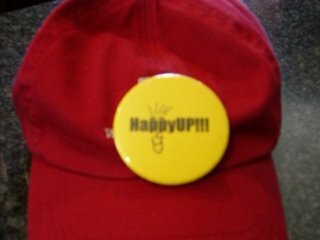 Remembered to think "HappyUP" - as I got out of bed and headed to bathroom. Started the day with gratitude on my mind with no mnemonic tricks needed. This is not the way most of us wake up....and definitely not how I used to. When I do, I notice it and thank God for continuing to work on me.....He knows...I need it. Found my nice shorts - in the pre-dawn mental haze, I gave up on finding the nice shorts that would be appropriate for the function I was going to. As I was heading out the door, I saw them on the dryer. Remembered to go back in to store and pay for coffee - in my focus to get to the airport, I self served and brain faded. I walked straight back to my truck. As I was opening the door to my vehicle, I realized I hadn't paid. I went back in and did so. I would have felt like a thief. I also would have had to go out of my way as I came back from my trip to settle up....well, that is if the police weren't waiting for me as I got off the plane coming home to arrest me for caffiene lifting. No traffic on the way to airport - sure, it was 4:50 a.m. so the odds were good for me. But, have you ever ran into unexpected traffic when you couldn't afford to. Take nothing for granted. Not stressing in line 1 - because I got to the airport 2 hours before my flight. The guy next to me is sending out a tremendously negative vibe. I am not even talking to him nor is he saying much. I can just feel the heat radiating from him. I got my bag checked out of turn - to my advantage. One clerk was servicing 4 self check in kiosks for people that had a bag to check. The other people had been in front of me in line. She looked at me. I smiled. It was a smile telling her that I knew she was harried. She checked my stuff first. I giggled to myself, "hey, that was kind of like taking 'cuts' in line without anyone knowing it." Notice the young couple next to me - and we engaged in a nice conversation. I don't always talk to people in line. Both the man and the woman had shaved heads. I didn't ask but I have the feeling that she may have been going through a cancer situation. Yes, I might have been stereotyping but I just had this feeling. If true, he had gone along and shaved his head in support. She looked lovely and I was glad I noticed. Breezed through the metal detector - no hassle, no wanding, I'm FREEEEEEE! Blood pressure - I just remembered stopping at the blood pressure machine yesterday. It was the lowest it has ever been. While I don't have high blood pressure, it doesn't mean that it couldn't be even better. Having a smooth landing - always tell that pilot, "you layed that one down nicely." Of course, you could just walk by the pilot like you expected the good landing as your only thought is, "where the heck is baggage claim." My pen is intact - sometimes, my favorite brand of pens explode on planes. .....................and on and on it goes - we have so many things that we think are supposed to "just happen" for us every day. The only time we notice them is when they go wrong. It is trite for us to say, "we take things for granted." Yes....we do. What are YOU going to DO about it? - how about starting to notice...to be present? It's easy to do - and even easier NOT to do. Seven days......just give me seven stinking little days - at the same time this week, you will be done with the project.....if you want to be. Here's the hook. After 7 days, you may not write the three things down at night every night but you will be effected by what you start noticing every day. When you say music - you are really saying one word....guitars! There is old lore that says there is only one reason that a young man straps a guitar around his neck - and there is probably a bit of truth to that statement. It doesn't matter what the style of guitar is...the Delta Blues of Lowell Fulson, breakneck speed of Eddie Van Halen, Wild Windmill Strumming while Spread Eagle Jumps of Pete Townshend, country magic of Chet Atkins, classical refrains from Andre Segovia.....talented guitar players are cool! That coolness and what it attracts drives many a young man to adorn himself with those 6 pieces of metal hung over a piece of wood. My motivation to buy a guitar never fell along those lines - it was about building up the courage to do something that I had been told as a young boy that I had no talent for....to play a musical instrument. Now, truth be told - I actually don't have much talent in the musical realm. 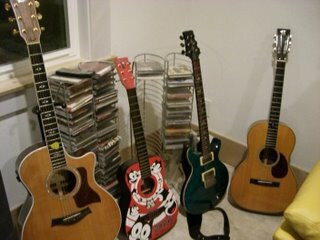 At times, a tinge of guilt washes over me for owning so many guitars but not really knowing how to make any one of them sing. Funny how we can be our own worst critics. But I quickly quiet that voice - I strum for my own enjoyment. I tell myself that someday I'll get serious about it...then remind myself that I really don't need to be serious about anything as long as I enjoy it. There are few things like pressing those hard wires - into that fretboard. The pain that came with developing the calluses on the tips that make playing possible. I have heard stories of good players super gluing the calluses that ripped off back on to their fingers. I have never approached that extreme...nor have I played until my fingers bled. Maybe I'm not serious. I often thought - wouldn't it be nice to have a few friends over and just strum while we all sung...not worrying about being a choir or a vocal group. Just relaxing and enjoying each other's company. Free from anyone judging us. But, no, no one does that anymore. That is for Andy of Mayberry or some young people dreaming to be a folk group. Then one day, I was asked - to start playing for our house church. I said, "no problem." I was just thinking that I was helping out. After doing it for a few times, it dawned on me, "hey, that little thought...that little thing about sitting around and playing and singing.....does that count as a dream that I had? 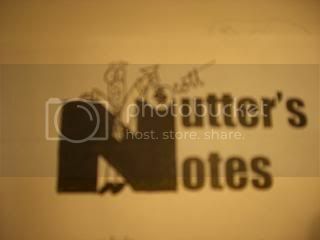 If it does, cross another dream come true off of my list." 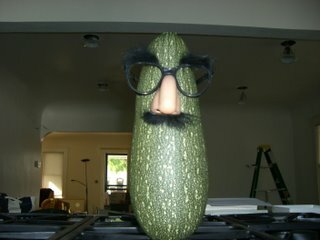 "Hey, did you hear about the zucchini that got too close to the steamroller? - ....squash!!!" Yes, I will cop to it - that crappy pun came courtesy of my rancid brain. Hey, I had to come up with something to go with the picture. If you run across a zucchini this big looking like this in a dark alley - run!!! ...or get out your food processor and muffin pans and make some cakes.....a LOT of cakes!!! A bed is the last thing in your life that you need trouble from. You can create all kinds of trouble once you are on or in your bed but the physical item should just do it's job. Squeaks, lumps, and slants are the common troubles that we are aware of. Economic conditions during different times in our lives may force us to tolerate a plethora of maladies that can plague this one specific place where all of us spend the most time in our lives. Why would anyone want to go out and buy trouble in this area? What? "Nobody does that," you say. Call me nobody. I've done it.....twice. That one word says it all, doesn't it? At this moment, do I even need to even elaborate. Your own stories or ones that you have heard are erupting to the surface like weeds in spring. The least of which but the one that quickly sends you to the couch is when the heater/thermostat malfunctions.....drain, new heater, refill, wait to get warm......your campin' somewhere else for 3-4 days at minimum. Nope, a bed should be something you can count on to deliver! I went this route recently - it was expensive. Our brains are wonderful things. Our ability to rationalize is a treasure. I wanted this bed so I could more comfortably sit up and read in bed. 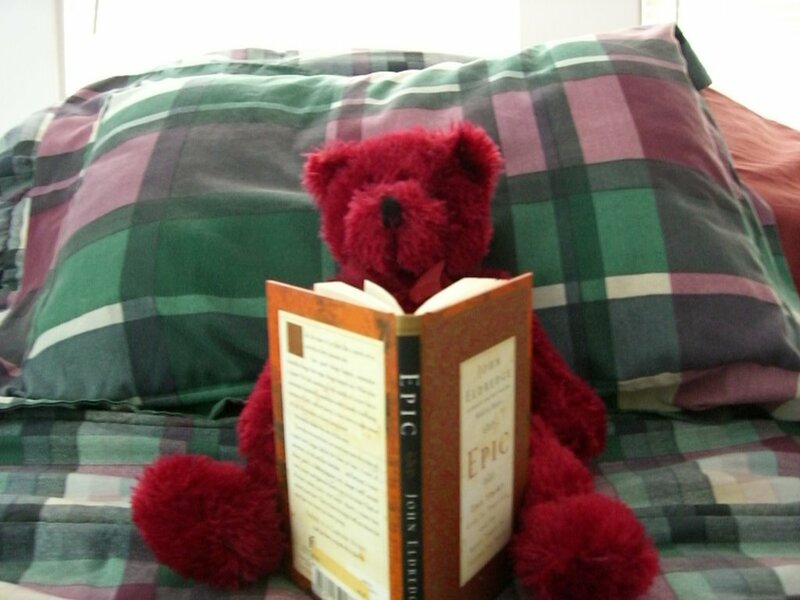 On many nights, I like to read before putting my head away for the day. You can stack pillows. You can buy wedges. You can do a lot of things to get yourself into a comfortable position. I wanted to do what I do best....nothing. What do we all look to do when we want to do nothing? We look to push a button. There was no need involved in this decision. This was pure want. I had a chat with the conservative ruler of my treasury (otherwise known as the left hemisphere of my noggin) and said, "hey, you spend 25 to 30% of your life in this place. It should be perfect. Quit being tight jeans!." Thank goodness for me to rationalize just about anything. ...and then the problems started. Faulty connections, faulty remotes, a bad motor..etc. But that's all behind me now - nothing left but to enjoy the outcome and what I hope becomes years of trouble free slumber. Bell!!! - listen, I have to look at enough of your baby pictures. I don't have any legged children so you can suffer through a few of these pics. Bell was the first out of the bunch this year...OK, I picked off a couple of strawbs that were early achievers first...he is my first edible vegetable of the year. Eat my children - call me a cannibal. It broke my heart but I have already carved into Bell. Funny, he doesn't have that waxy taste that you get from the store. Hmmm....perhaps I'll find a candle and do a little dripping on the other half of him. More to come - as the Lord continues to make His presence known. Hallelujah!!! 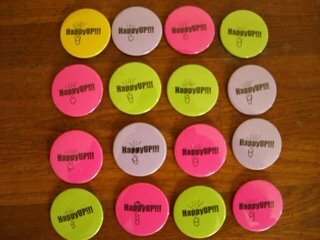 HappyUP!...Coming to a town near you soon! Yep, were hitching up the HappyUP! wagon - and hittin the trail again. Just two weeks from yesterday. Saturday, June 24 - the Nutster will be in Dixon, California (that's near you, right?). I am grabbing about 45 minutes of Randy Vice's 4 hour, "How to Have a Better Life," seminar and taking us all back through HappyUp. 4. Write those down and note WHY you thought they happened and WHAT was it about them that made you happy. Gang, being happy (or happier...hey, you don't have to be sick to get better) - takes work. If you want to take your game from a 5 to a 7, you have to do something. What? You say that you are at a 10? Wow!!!! - one question: why did you stop? HappyUp every day...take 10 minutes to summarize every night - do it for 7 days. C'mon...you have the time. Do it for 7 days....better for 14 but I'll take 7. It will change your life for the better - guaranteed! So, I ask you - what does it take to take your breath away? Is it so complex that it takes a special set of circumstances? Are you so busy chasing the wind that you haven't stopped to notice lately....for a long time....ever? Must you go to the sea or the mountains? Like acres of diamonds - it sits around you. Go take a look and let me know how you do. Click It or Ticket? Do I or Don't I? 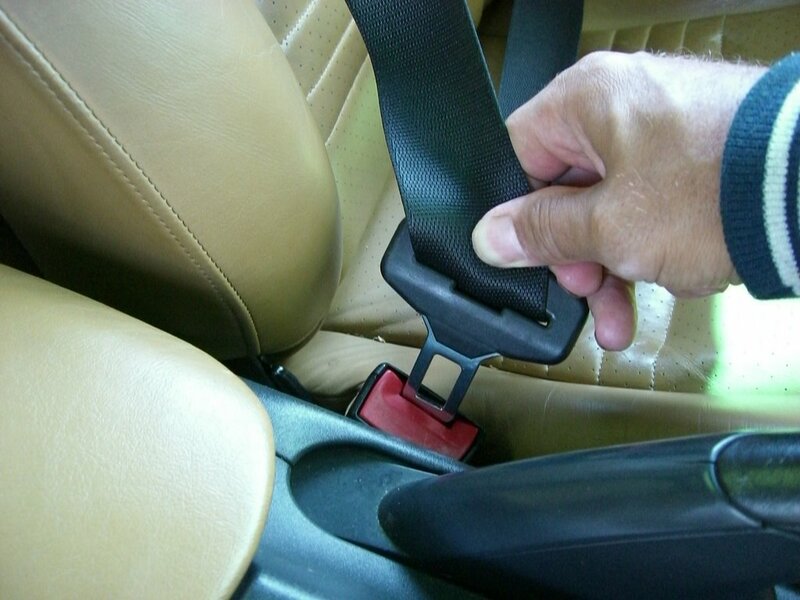 Click it or Ticket - that's right. Fasten your seat belt or you are getting pulled over. I have been informed that the second offense is going to knock you back over $150. The interesting thing is all of the mindless people that have jumped on the bandwagon thinking this is a great thing. I don't see it that way - I am all for keeping the roadways safe. When I fire up the Nutmobile, I want to know that law enforcement is out there making sure that the path to where I need to go is as free of law busters as possible. At first, most police would not pull you over for this violation - it was more of a "rider to the bill" after they pulled you over for something else. California just went through a major campaign....advertising...marketing....the whole schmeer. Now, I am no idiot - the gendarmes had to be getting rated during this campaign for how many tickets they wrote. The entire marketing was, "clickit or ticket," so if there is no ticket, there is no campaign. It only makes sense. I have two problems with this - 1)the taxes that I pay to keep the roadways safe for my drive are being squandered. Sure, I guess the risk of a body flying into my convertible from an accident that just happened next to me was decreased. Quite frankly, I am willing to absorb that risk to keep our peace officers out there ticketing people who run red lights. 2)I am not a civil libertarian but we do have to keep an eye on our rights. If I want to increase the risk of damaging me and me alone, that is my call. I know...I know - "what about the people that don't have insurance? We have to pay for them." First, in California, everyone is SUPPOSED to have insurance. Second, if we are heading down this slippery slope, when is someone going to start handing out tickets at McDonalds and Cold Stone to people that are killing themselves with what they are ingesting. We don't even have to talk about citations for people smoking. Sorry, this argument doesn't hold water. People need to be responsible - and make their own decisions and suffer the consequences...particularly when their decision doesn't effect anyone else. In the meantime - I'll be buckling up. I drive a convertible. I don't want you to be inconvenienced by my body flying into your car if I have a wreck with a guy that ran a red light. You know, the guy that would have been pulled over two streets back if the policeman wouldn't have been busy ticketing a guy that didn't have his seat belt on. ...drawn from the post that follows this one. Honestly, vegetable gardening does not take that much time - right now, I am sitting on 24 plants. The initial soil preperation, buying of plants, and planting them probably took me a day if you put all of the time together. Keep in mind, this year, my garden was grass so the soil preparation took longer. In the last 6 weeks - the only thing that I have done is water. Now, while I water, I do try to pull out a few weeds. 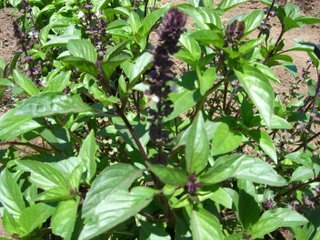 Weeds steal the valuable water from your plants which is why you do it. Yes, you can do it for aesthetics but that really isn't what I am into. Hmmmmm...did you see the paragraph above - increased efficiency versus time being spent where I enjoy it. The irrigation system is going to be a little mental debate. I wouldn't want to succumb to just wanting the outcome without putting in the work (which all of a sudden reminds me that is how people can get themselves in credit card trouble). It is the time during the work that I enjoy. It's good quality time. 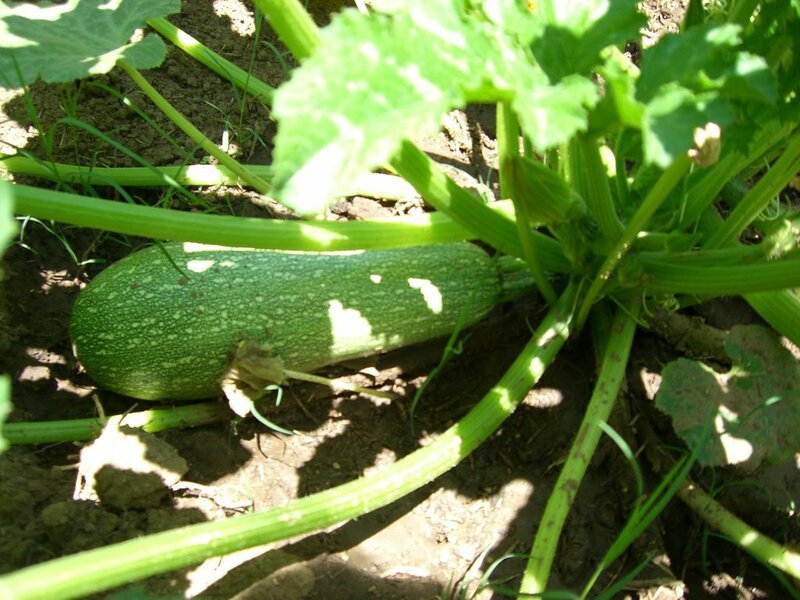 So, we have established that vegetable gardening isn't that difficult - it takes less water than lawns do. Lawn is a weed. Yes, even the beautiful green patch sitting out in front of your house is a weed. It may be a desirable weed but it is a weed nonetheless. What if everyone in my neighborhood committed to less lawn - and less "stylistic" ground coverings and devoted more space to vegetables? Hold on...this is going to get mind blowing. "Nutster...you be the tomatoe guy" - a neighbor might say. "Everyone in the neighborhood will know it. Grow them in your front yard too. Instead of looking at you as eccentric, we'll all be thankful that you donated your front yard to provide for us." What if the entire neighborhood shared what they grew with everyone? ...and shared their knowledge? ..and helped in each other's garden? The elderly lady may not be able to garden anymore....but she has an overgrown yard in the back that she can't afford to maintain. She would get some of the vegetables too! We would probably all have to get to know our neighbors a bit better - imagine that. No, we could never do that. We like to complain about them too much. We like to pine about how places where more like community back in the good ol days. Perhaps they were more communal because we communicated more. Now, we pop the garage door opener and don't have the opportunity to run into someone as we go into our homes from the front door. The above paragraph takes me down another rabbit trail - when you think of the word "commune", you think "weird"..."not something I want to be a part of", don't you? Yet, the root is the same as communication and community. These are things that many of us feel might cause our lives to be improved if we had a bit more of them in our lives. 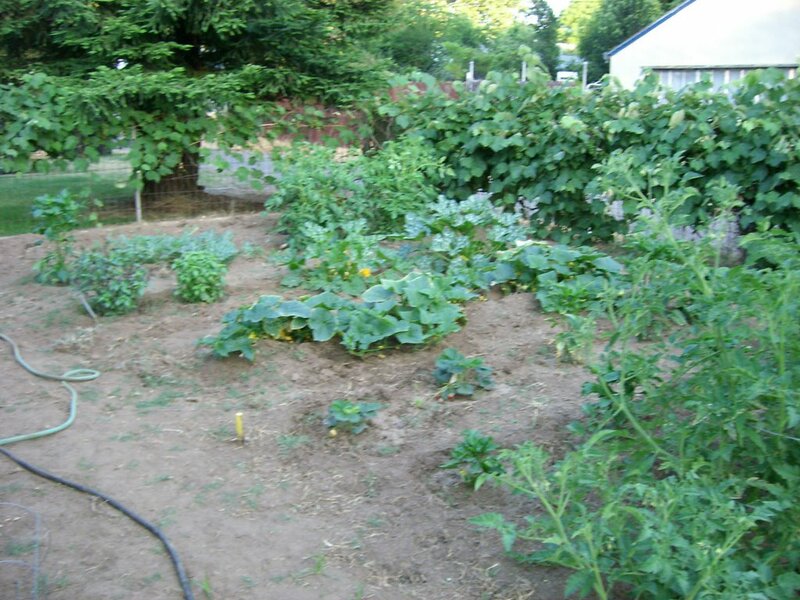 Vegetable gardening - could create community in a neighborhood. It would use less water. The water that was used would be for sustenance rather than looks. It would probably be a bit more organic....any of us could use a little less cancer in our lives. One has to think that all of the chemicals that go into our food have to play a bit of a role in the higher level of disease that we have in the west. We might actually "live off the land" and eat the fruits and vegetables that we should. I could go on and on - but, let's face it. We don't want to make any of the changes that this would entail, would we? We would rather isolate or busy ourselves with meaningless things that truly are "chasing the wind" as Solomon said in Ecclesiastes. Still, it was a lovely thought to park on - for a few moments on this gorgeous June morning in Roseville (near Sacramento), California. It's a mystery to me - that on April 30th, my backyard looked like this. Well, an even bigger mystery was how I got my dad's old rototiller started to till up all of the old grass and even get it to this point. Add to that, I found the motivation to run a rototiller for the first time....and then rake out all of the clods and roots and debris. Where did that come from? But, beyond my total lack of knowledge about soil preperation and overcoming my laziness, on April 30th, this is where we were with the small patch of grass out behind the tool shed. Yes "that" has become "this" - and I am not being self-deprecating about my lack of skill or knowledge. I, honestly, know absolutely nothing about gardening. I have never really done it before. I haven't read much. I didn't go down to Home Depot and take a class. I played around with a tiny patch last year and got some nice tomatoes out of the deal. Let's face it. 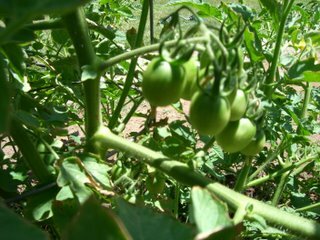 Tomatoes are a weed. I think anyone reading this blog feels fairly confident that you could grow a weed. Yet, here I am - just a few short week's from enjoying the mystery of how we can be provided with sustenance......and so grateful that this mystery exists. Nature's bounty. 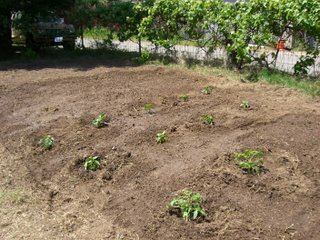 Tomatoes - cherry, early girls, and beef steaks...6 plants in all. Way more than I will need. 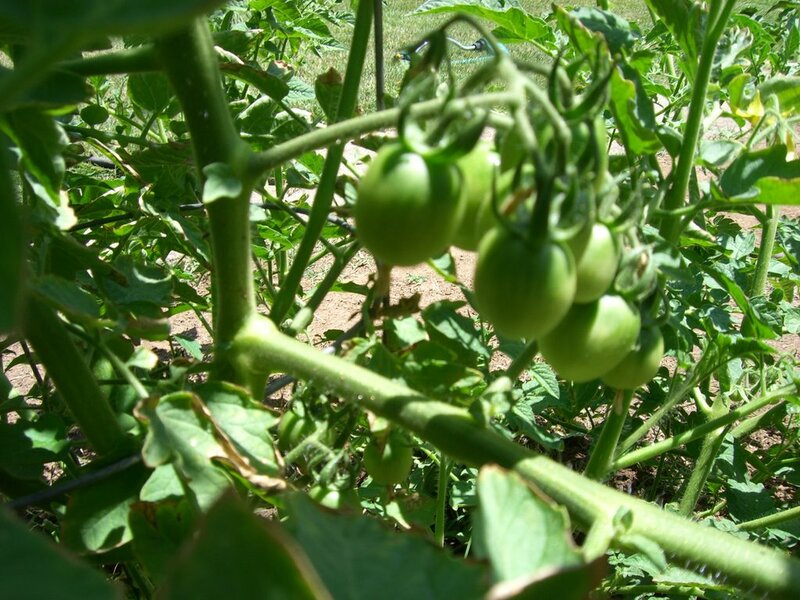 Every plant has reached the stage of bearing fruit. This is good. I have been told that sometimes you get nice plants but no fruit. 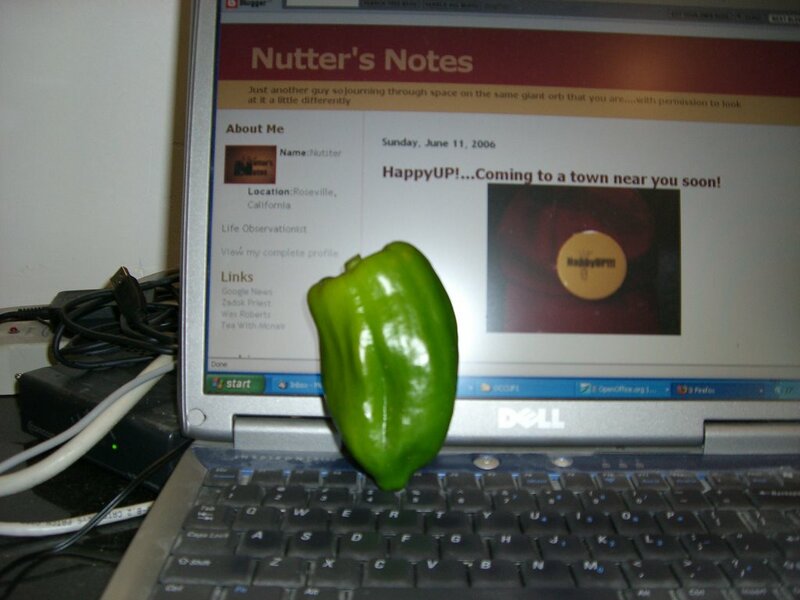 Bell Pepper - one fully developed bell pepper is showing. I know there will be more but, right now, there is only one and it is almost ready to eat. That's a mystery. It is almost as if His Divinity is saying, "here is one for you to eat today...see the little bud? You can eat that one later." Cucumbers - the leaves are so big that you have to peel them back so you can peek inside and see the little babies that the plant is keeping shaded. It is almost like she keeps them in her secret pouch and is sheilding them from the elements. Squash - HUGEMONGOUS plants with several fully formed and preparing themselves for my dinner table. Watermelon - I don't see anything yet but a creepy crawly vine spreading it's tentacles about the garden. Will it bear a watermelon?....several of them? Who will I give the watermelons to because I don't really eat watermelon? Maybe I will eat watermelon this year...and lots of it. All mysteries. Strawberries, basil, pepperoncini, jalapeno's, the "wonder pepper" (yes, that is what it was called when I bought it...so that's a mystery in itself)...all doing well. 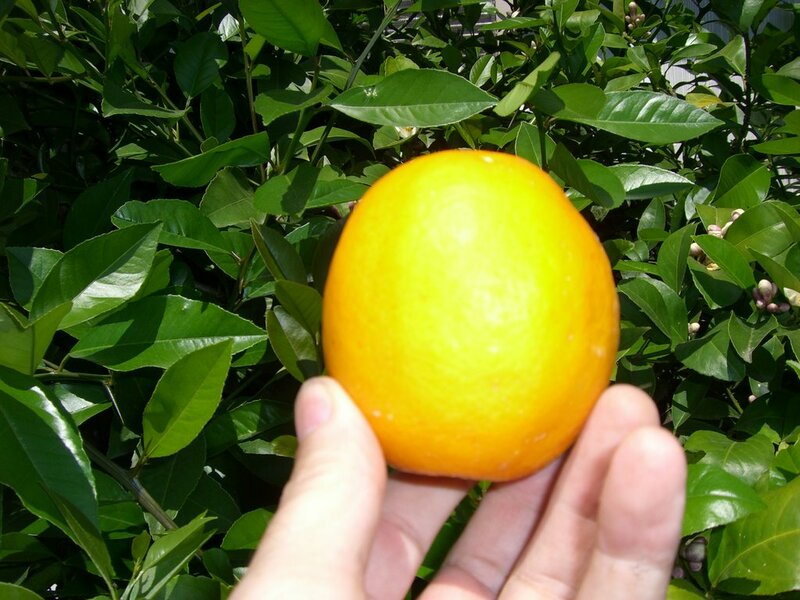 Then we have the old growth around the yard - the orange tree, the lemon tree, the fig tree, and the grape vines. I just pruned back a lot of grapes to allow the grapes I left to have more sustenance so they will be bigger. Someone gave me this tip. If this makes them bigger, perhaps the seeds won't be so bothersome. One gardening uneducated man.....one small suburban lot - sitting on so much abundance that he'll have nothing to do but share with his neighbors. This is a story about the greatest mystery of all - God. He truly is a wonderful Father. This is a wonderful metaphor to show that He provides for His children much more than they need, without that much attention, and despite their actions. I think it is time for me to sign off - and spend some time with Our Father to thank him for being so good to us all in so many ways. Would I like to unlock the mysteries of God? - I only think that doing so would diminish Him. I think I'll be content with leaving things as is and enjoy His great mystery. OK...there you have it - I went out and said it. I'm a book freak! It's a problem - I am in the midst of a terminal remodeling project. I moved into the old house about 1.5 years ago. I never have really gotten settled as there has been some much overthought of rehabbing to do. 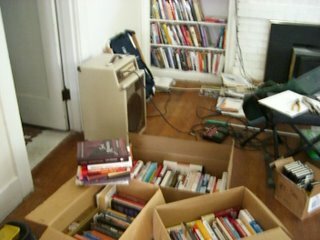 And I have to address "the issue" - how did I get so many books? Many read with a commitment to re-read. Others started. Others waiting. I'm sure more will get through the front door within the next two weeks. But some have to go - but which ones. "I really might read this one again." "This one doesn't seem as interesting as when I bought it but, I started it so I should finish it." Almost none jump out and scream - "this one has to go!!!" It is almost like they are children. That's just sick. For goodness sakes, they are just a bunch of paper bound together. Where will they go? - aaaahhhhhhhhhhhhhhhhhhhhhhhhh! A young boy. His two older brothers gone to school. Living in the country. His mother staying at home from work a little longer than originally planned to take care of "the little afterthought." A long way to the grocery store. I've gone back in adult life. While the original road is gone, I have it estimated at 4.5 miles. The mother loads him into his wagon. There is no second car. She pulls him along the long road. There are no sidewalks. She gets her groceries. She puts them in the wagon. They turn around and head back. The wagon full of groceries and a 4 year old boy trailing along. I wonder if making a 4 year old walk 4 miles would be called child abuse today. I call it doing what you have to do.....and those things are usually good for you.